The moment Paul and I announce we’re getting married, I reach for the maps and start thinking ‘honeymoon’. As we’re signing on the dotted line at a deliberately low-key affair in London, our plan is to follow up the ceremony with a memorable romantic journey that culminates in a blessing. We fancy somewhere uncommonly exotic, photogenic but not familiar, off the tourist track but not tricky to get around. The answer is Laos. Colonised by the French, this colourful, largely Buddhist ‘Kingdom of a Million Elephants’ still feels intoxicatingly new. Majestically mountainous and still mysterious, Laos lies wedged between Thailand, Vietnam, Cambodia, China and Burma. We start in the south and work north, which means flying into Champasak province and boarding a trio of boats lashed together, with wooden planks to support six vehicles up the Mekong River. As strutting cockerels patrol the shore, the in-voyage catering gets underway, with women in woven hats wrapping sticky rice in banana leaves. At times it feels like we’re at the seaside – during the dry season, guests at La Folie Lodge get to enjoy a huge, deserted beach. Sitting on a balcony, painting my toenails, I can hear nothing but the deep bellowing of water buffalo wading along the shore. The whole of Laos feels like Laid-back Central. Even in tourist markets, the haggling is half-hearted. The Laotians are a slow-to-anger, endlessly welcoming and keen on their food – a fusion of hot and spicy Indo-Chinese fare and garlic-laced French cuisine. A visit to the half-towering, half-tumbledown ancient Khmer temple of Wat Phou is tremendous, while wandering near another of our southern hotels, the Kingfisher Ecolodge, we chance upon the magnificent sight of mahouts steering their elephants into a pool for trunk-to-tail ablutions. Luang Prabang, our next stop, casts its spell in seconds. It’s a gentle, beguiling city boasting intense colour, immense antiquities and fading French colonial architecture. Here we meet Lien, the master of our ceremonies, and have our most luxurious sojourn at La Résidence Phou Vao. It’s an exquisite hilltop oasis with dramatic views of temples jutting through coconut groves. The staff lay on a ‘500 Candle Dinner’ set on a private deck, where we are surrounded by a flickering, winking ocean of light. As the meal – chicken on lemon-grass skewers and Mekong perch – draws to a close, two massive mulberry paper balloons, powered by candles and packed with good wishes, float into the night sky. The next morning, Lien drives us to Ban Xienglik, his village in the hills just outside Luang Prabang. We spend the day floating in and out of temples as both of us sport a silk sash specially spun by Lien’s wife for the occasion. It soon becomes clear that the entire village is involved in a re-enactment of a traditional wedding back at Lien’s gaff. Paul is paraded through the village, I’m fussed over by the ladies and, sweetly, everywhere has been decorated with flowers and balloons. In Lien’s house, a shaman, stationed on the floor, chants and orchestrates intricate rituals involving rice, thread, rice wine and boiled eggs – all in the name of fertility and love. Then – boom! The PA system kicks in and a hundred or so guests dance, sing, swig Johnnie Walker, sink Beer Lao and dive into a massive buffet. At first I feel hot and, frankly, bewildered, yet the immense effort the villagers have gone to, and their warmth and enthusiasm, touches us. When I later find out that treating travellers to this special event is pretty rare, I feel privileged, too. The next morning we board a 40ft teak boat for a lazy sail up the Mekong, through soaring mountains and cappuccino-coloured currents, and some of the best views in Laos. At Huay Xai we clamber up a muddy bank to present ourselves at a deserted passport control on the Thai border. It looks more like a place to swap spies, and we look back fondly at Laos, its misty mountains melting into a marmalade sky. 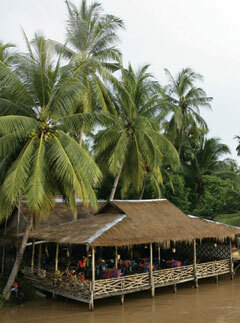 Audley Travel (01993 838 150; audleytravel.com) offers tailor-made trips to Laos. A ten-night tour, including stays at La Folie Lodge and La Résidence Phou Vao, plus a two-day Mekong river cruise, costs around £2,200 per person, based on two sharing. The price includes international flights with Eva Air from London Heathrow to Bangkok, along with all local flights, transfers and excursions. A ‘500 Candle Dinner’ at La Résidence Phou Vao costs from £73 per person. Village ceremonies range from around £90 per person for a Baci blessing to £380 per person for a full-blown celebration with food, drinks and music. The best time to visit is November to April. Visas are required (available on arrival) along with anti-malaria precautions. For more information, read Laos (£13.99, Footprint Handbooks). 4. Drive across Jamaica to a reggae beat (islandoutpost.com). 5. Head to the Arctic for hip hotels and the Northern Lights (discover-the-world.co.uk).